The American Red Cross – Palmetto South Carolina Region is looking for volunteers like you. Help serve as a transportation specialist (see job description here). Every two seconds, someone in the U.S. needs blood. As a volunteer transportation specialist, you can make sure blood is available for patients in need in South Carolina. Transportation specialists deliver lifesaving blood to hospitals, ultimately giving them a sense of purpose and empowerment by knowing that they are part of the solution for helping save lives. Shifts originate out of Columbia and Charleston. Weekday and weekends routes are available. Volunteers will need a valid driver’s license, a motor vehicle record and must be able to lift up to 45 lbs. Visit redcross.org/SCdrive for more information. Interested volunteers should contact Kathryn Pratt at Kathryn.pratt2@redcross.org. • Must have demonstrated ability in Microsoft Office, including Word, Excel, PowerPoint, and Publisher. Additional Comments Regarding Position This position reports directly to the Director of Operations and Outreach in the Office of the Dean, School of Education, Health, and Human Performance. This position has no supervisory responsibilities. Must exercise independent and responsible decision-making along with working collaboratively with colleagues from across the institution. Special Instructions to Applicants Please send resume to Mrs. Dee Stalvey, Director of Operations and Outreach, School of Education, Health, and Human Performance at stalveyd@cofc.edu. *The candidate filling this position may be eligible for healthcare benefits. Develop, design, edit, and oversee the production of print and digital publications for the School of Education, Health, and Human Performance, including selected advertisements, mass and select mailings, recruitment materials, event invitations, public reports, and electronic newsletters. Serves as the School’s liaison with the College of Charleston’s Marketing office. Assists in planning content and revising the School of Education, Health, and Human Performance website and directs all social media platforms for the School. Assists the Director of Operations and Outreach as needed in the area of communications, particularly as it concerns the need for marketing initiatives. Assist, coordinate, and execute a portfolio of events for the School of Education, Health, and Human Performance, including awards programs, multiple VIP functions and receptions, educational symposia, and other meetings on behalf of the School of Education, Health, and Human Performance. These responsibilities include scheduling and coordinating speakers and guests, publicizing events, managing correspondence, composing memoranda and invitations, and coordinating all logistics for each event, including securing event spaces, selecting menus and preparing decorations, and coordinating with Physical Plant and other offices on campus as needed to ensure successful events. Providing administrative support for the Office of the Dean, including but not limited to: clerical processing and database entry related to committee activities and special projects; answering and directing phone calls; organizing and scheduling appointments, as directed; taking detailed minutes/notes as required; composing correspondence, memos, forms, etc. ; providing general support to visitors; editing, formatting, and maintaining electronic and paper files, posting and distributing materials; and other administrative duties as required. Assists the Director of Operations and Outreach with the School’s scholarship program, which includes many important responsibilities, including knowledge of the School’s scholarship donor agreements, monitoring compliance with donor agreement guidelines and assisting the Director of Operations, as well as the Development Coordinator, as needed in negotiating changes to guidelines when appropriate as it relates to awarding scholarships; works with the Office of Student Financial Aid and scholarship committees on campus as needed in order to facilitate the coordination of scholarship efforts; and, analyzes, prepares and coordinates the scholarship application applications received with the Office of the Dean staff members and faculty scholarship chairs, and coordinates the award notification to scholarship recipients, and organizes and coordinates the donor thank you process. As another aspect of scholarship responsibilities, this position also receives daily gift reports from Institutional Advancement and works to personalize letters from the Dean to donors. The Citadel Athletics Family is currently looking to fill a summer and fall internship position in the Marketing Department. To apply, email your cover letter and resume to sportmarketing@citadel.edu. Entercom Greenville offers an opportunity for students to apply classroom theory to practical experience. Our internship program allows students to experience firsthand the reality of working in the radio broadcasting industry. Interns can test their creative talent, exercise their analytical skills and increase their understanding of broadcasting operations and trends. Internships are available year-round, and are 12-15 hours per week, with specific days and times agreed upon in advance. All interns must be enrolled in a College or University and receiving college credit. Students are expected to obtain and complete any forms necessary to receive credit for the internship experience. Entercom Greenville will assist students with the completion of such forms and provide information concerning duties and responsibilities. Internships are available for all stations in the following departments: Promotions, Programming, Production, Sales, Business Office & Web Development. To apply, please direct your inquiry to Mandie Soter, Account Recruiting Manager at asoter@aerotek.com. 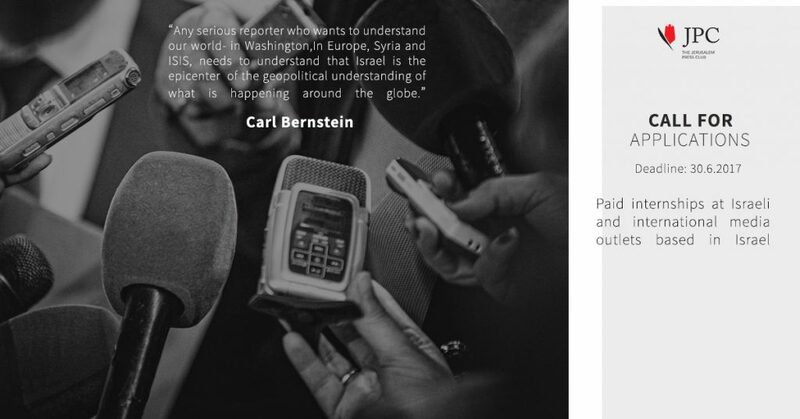 The Jerusalem Press Club is offering paid internships at Israeli and international media outlets based in Israel. These internships are open to alumni of Graduate Journalism Schools with interest in international reporting. Weekly enrichment on the Middle East, Israel and the Palestinian Territories, at JPC. A selection committee consisting of leading foreign correspondents will select the winning candidates for 2017. Samples of journalistic works, if available. Send applications no later than 6/30/2017 to jpcfellowship@gmail.com. US Club Soccer, a national soccer organization headquartered in downtown Charleston, is seeking a highly motivated intern to work in a communications-related capacity this summer. This person will gain valuable experience working in all facets of the communications department, while specializing in digital operations, including: content production, social media, graphic design, email communications, database management and sponsorship-related presentations. The intern will be expected to work in the US Club Soccer operations office on a schedule to be determined by the Senior Manager of Communications. This position is a paid internship. Interested applicants should email resume and clips to Tyler Heffernan at theffernan@usclubsoccer.org. Garden & Gun seeks an organized, hardworking, and detail-oriented individual intern to support the efforts of the Integrated Marketing department. Ability to communicate well on the phone with vendors, etc. cover letter and resume attached.